Home About Universe Alien stars Astrobiology Astronomy Astronomy Picture of The Day Beginners Black holes Gallery Info Infographics Missions Physics Quantum Mechanics Technology Is There a Parallel Universe That's Moving Backwards in Time? Is There a Parallel Universe That's Moving Backwards in Time? Time, as we understand it, moves from the past to the future irreversibly. But now, an international trio of theoretical physicists is suggesting that there’s more than one future. 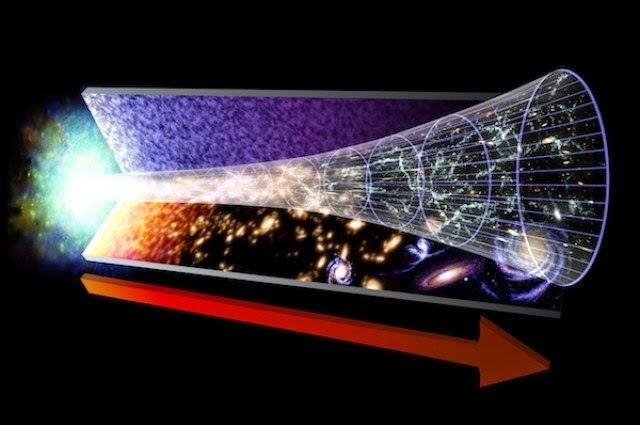 Two parallel universes were produced by the Big Bang: ours, which moves forward in time (pictured above), and another where time moves backwards. These findings were published in Physical Review Letters in October. In the 1920s, British astronomer Arthur Eddington coined the term “arrow of time” (sometimes “time’s arrow”), which describes the asymmetrical, one-way direction of time. Many physicists today accept that time moves in the direction of increasing entropy—or disorder, randomness, and even chaos—in an effort to approach some equilibrium among all of the things. According to this thermodynamic arrow of time, things increasingly fall apart. If that’s the case, then our universe must have began in a low-entropy, highly ordered initial state. But why would there have been this rare moment of low entropy in our past? One century-old idea developed by Austrian physicist Ludwig Boltzmann is that our visible universe is a temporary, low-entropy statistical fluctuation that affects only a small portion of a much larger equilibrium system, APS Viewpoint explains. Here’s another possible explanation. Oxford’s Julian Barbour, Tim Koslowski from the University of New Brunswick, and Flavio Mercati of the Perimeter Institute for Theoretical Physics are introducing a new arrow of time, one that’s based not on thermodynamics, but on gravity. "Time is a mystery,” Barbourtells the Daily Mail. “Basically, all the known laws of physics look exactly the same whichever way time runs." To arrive at this “gravitational arrow of time,” they used a simple proxy for our universe,ScientificAmerican explains: a computer simulation of 1,000 particles interacting under the influence of Newtonian gravity. They found that every particle configuration evolves into a state of low-complexity—like a chaotic swarm of bees that settles into a more orderly structure analogous to Boltzmann's low-entropy fluctuation. And from there, the particles expanded outward in two distinct, symmetrical, and opposite arrows of time.